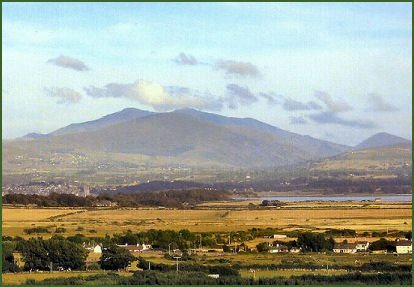 The village of Newborough, or Niwbwrch as it is known in Welsh, is located in a superbly scenic setting at the south-western corner of of Anglesey. The settlement was founded in 1294 by King Edward I of England, to house the people he had evicted in order to build Beaumaris Castle, which guards the eastern end of the Menai Strait. The remains of the court buildings of Llys Rhosyr, thought to be the royal llysoedd (courts) of the Welsh princes of Gwynedd, are situated on the outskirts of the village. The site was buried during a fierce sandstorm in the winter of 1332 and discovered in the late 1990`s. Excavations carried out by the Gwynedd Archaeological Trust uncovered stonework and foundations beneath a depth of sand and identified a number of important structures, surviving at least a foot or two above the foundations. There is an exhibition on the Llys Rhosyr site at the J. Pritchard Jones Memorial Hall in the village, which also houses the library. The Prichard Jones Institute was donated to the village in 1902 by Sir John Prichard Jones, owner of the London store, who was born in the Newborough. The Anglesey Model Village located between the villages of Dwyran and Newborough, continues to be improved on every year, set in one acre of beautifully landscaped gardens with water features and a good selection of plants and trees. All models are built to scale of one twelfth full size, including the Ynys Mon Express which circles the lake pausing only at the World famous station of Llanfairpwllgwyngyl. Newborough Warren forms one of the largest areas of sand dunes in Britain and was formed in the 13th century when violent storms buried the farming region under a blanket of sand. Much of the area around Newborough has been designated a nature reserve. The intertidal mudflats and saltmarshes are important wintering grounds for waders and wildfowl regularly supporting over one per cent of the British population of Pintail. Llandwyn Bay is a spectacular sweep of sand and has stunning views across to the mountains of Snowdonia and the Lleyn Peninsula. The reserve contains outstanding flora, interesting lichen and moss communities and a wealth of invertebrates. Access is signposted from the A4080 in Newborough and is through a forestry commission toll road operated by a toll barrier. The reserve is managed by the Countryside Council for Wales (CCW). 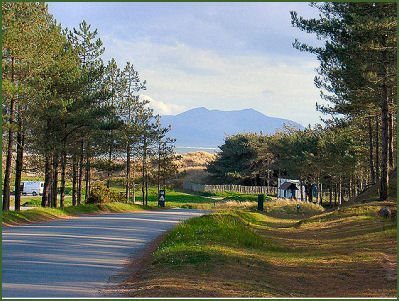 Newborough Forest covers 2,000-acres (8 km²) and offers excellent walk with stunning views. The forest, consisting of mainly corsican pine, is one of the most important red squirrel conservation sites in the British Isles. Three trails are available leading to several bird hides and a lake. Parts of some of the houses buried by sand in the 13th century, can still be seen forest. The forest has been the subject of heated debate, planting began after the second world war but concerns were raised in the late 20th Century about the damage being caused to the environment by the forest, particularly that the water levels within the Forest and within the neighbouring Newborough Warren were falling, with the result that winter flooding was not to the same depth and that dune slack pools were drying out sooner, but plans to cut back the forest have been abandoned . There is an expansive sandy beach at Llanddwyn, which is a holder of the coveted Blue Flag Award. The beach provides access to Ynys Llanddwyn (Llanddwyn Island), wreathed in legend, the island is technically a spit of land jutting out into Caernarfon Bay off Anglesey's south western tip and only really an island at the highest of high tides. Designated as an Area of Outstanding Natural Beauty, stunning views of Snowdonia and the Llyn Peninsula may be had from the island. Dwynwen, the Welsh patron saint of lovers and one of 24 daughters of St. Brychan, a Welsh prince of Brycheiniog (Brecon) from whom the island derives its name, built a stone church on Llanddwyn Island in the fifth century. The ruins of the sixteenth century St. Dwynwen's Chapel may still be seen and occupy the site of Dwynwen's original chapel.